Do you guys ever feel like you are living the same day over and over again? That has been me for the past few weeks. Everything is so boring lately! I definitely have a case of the January blah’s and am ready for this month to be over! Thank goodness February is just around the corner. Sometimes it isn’t all about that fantastic statement piece that makes an outfit, but rather the subtle details that pull everything together. This is how I felt about this throw on ensemble that I wore this weekend…it’s all in the details. I am obsessed with these jeggings I got for Christmas. Obsessed to the point where my sister got them first and rather than just borrow them from her, I had to have my own pair (sometimes I can be such a copycat, oops!). The print is subtle enough that they can be mixed with just about anything, but is way more fun than a solid color. This jacket has been my favorite purchase this year, as it is light, but allows me to layer up underneath. The other day, I had on a tank top, a long sleeve t, a thermal andddd a wool sweater, with a scarf and this coat and I didn’t even break a sweat while sitting in Starbucks like I totally would have while rocking my North Face. Thank you, safari cargo jacket, for allowing me to stay cozy and at the perfect temperature! update: i literally just checked ae online and they don't have my size. sad day haha but good for my wallet! Great look Ashley. You are so right, it's all those little details added together that makes this outfit. Hope Feb gets a lot more exciting for you! 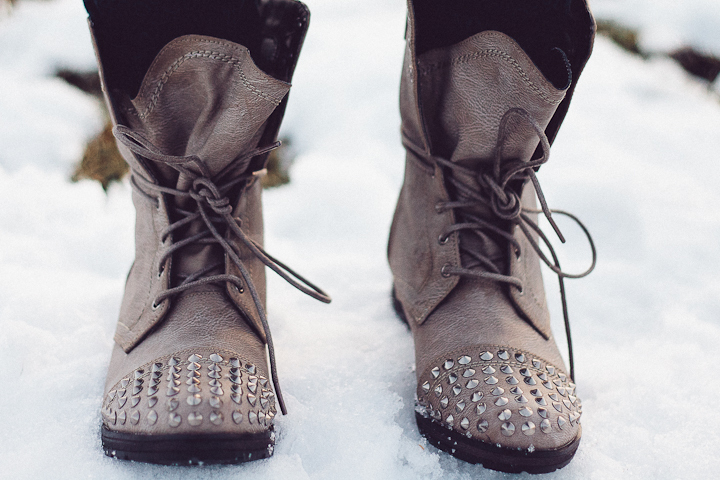 OMG, those studded combat boots need to be in my closet! They're beyond edgy and just what I've been looking for, I love my black ones, but I really want to mix it up. 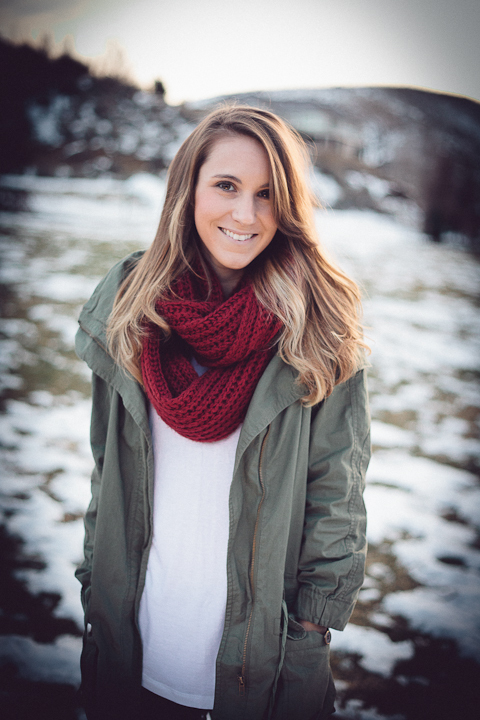 The red scarf is the perfect pop of color, to your wintery outfit. I totally know what you mean, this January it's been all about the scarves and sweaters for me, lol. i love your scarf and your shoes … you look lovely. great outfit. Love this combination, especially those studded boots!! I love this look. I love these comfy looking cargo jackets but have yet to make a purchase. Your post just might be pushing me over the edge. 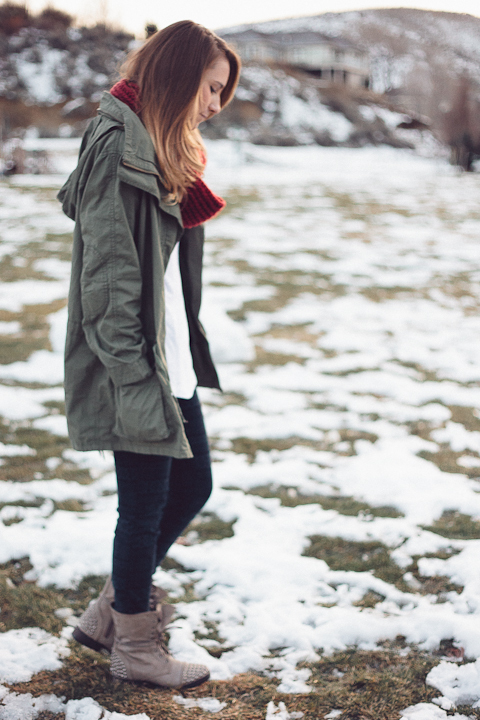 I love this whole look–the jacket is perfect for those cozy winter outfits. And studs on boots? I mean, perfect! 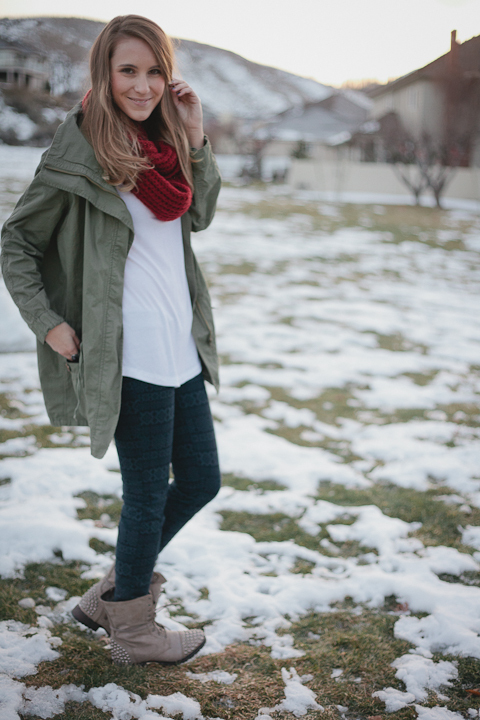 I love the subtle pattern on those jeggings! 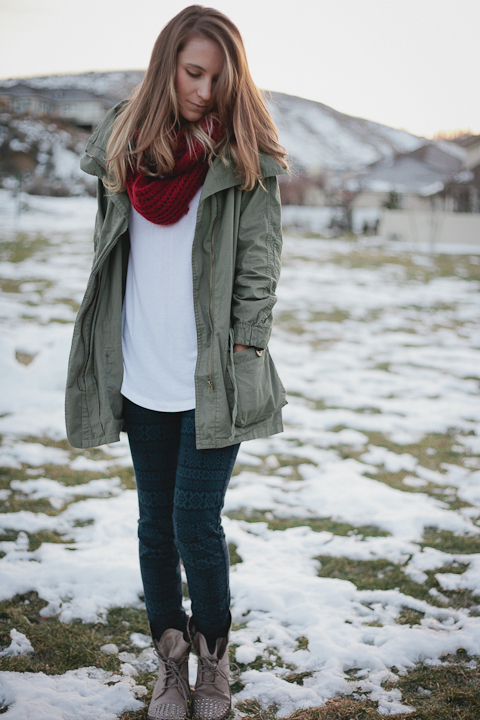 This is such a perfect cozy winter outfit! Cute outfit! I understand the January blahs. We've had some clear and sunshine-y days recently and it has definitely lifted my spirits. It's crazy how weather always plays such a big role in our mood! Lucky you to find those boots for $37!! I feel like everyone wants the Steve Madden ones (for obvious reasons, they're so cute!). But yours look just as awesome, and for such a better deal! I also adore your red scarf against the green jacket. Pretty pretty lady! Haha, I think I'm going to wear something similar to school tomorrow. This look is definitely made spectacular by the subtle details! Those boots are just mind-shockingly awesome *_* What a score! Love your boots! You look so cute. Perfect combination of clothing! You just cannot go wrong with this jacket, it looks good with everything! And what a great score with these boots, they're fantastic. 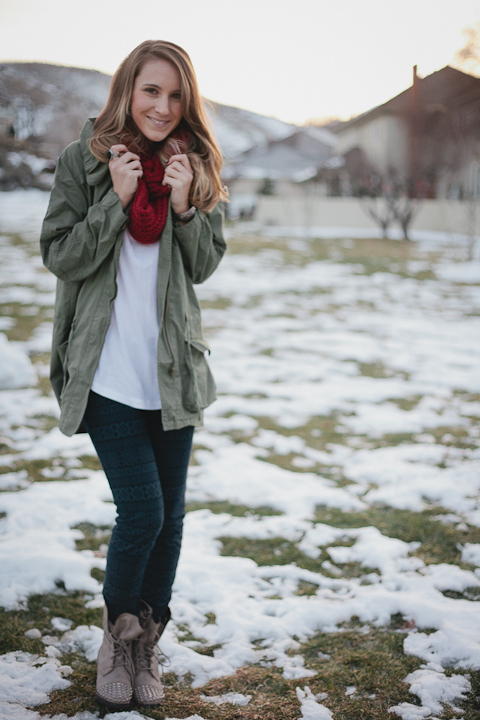 This outfit is precious and your blog is wonderful. You are also gorgeous! Awesome post love! You look absolutely gorgeous, girl! 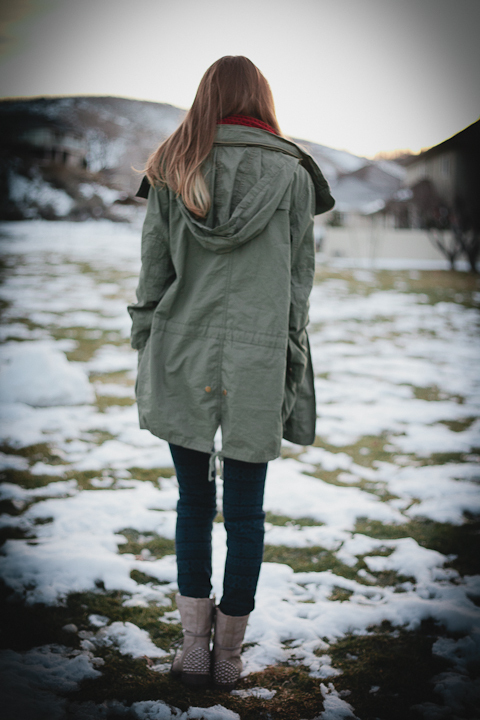 I love your parka and those boots! I love love love love love it all! Especially those boots. They are just the bee's knees and I may have to play copycat and snag a pair for myself. SO cute. LOVE YOUR BOOTS!!! You look so pretty. Can i copy this look? :P it so casual and perfect for going out to school. This is so cute and casual! My sister has those boots, love them! And that military jacket is perfection. In love with this outfit! I especially like the cool printed jeggings with the studded boots. And for $37?! Awesome find! That jacket is SO cute! 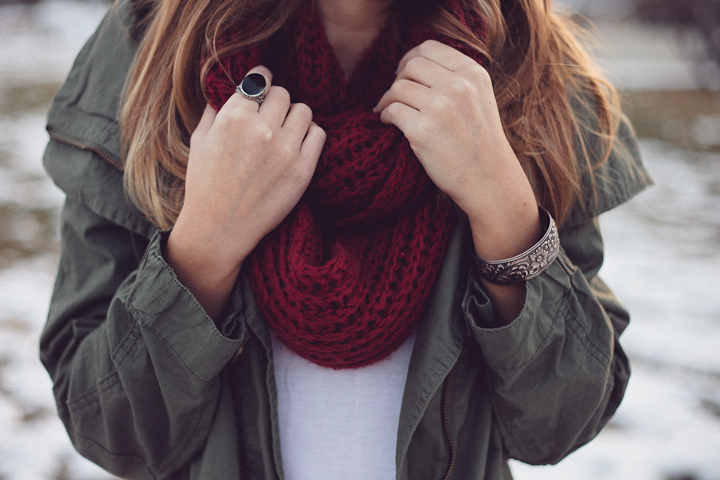 Love it and the beautiful color in that scarf! love the boots! ive been wanting the steve madden ones for a while now, but far too pricey! i think ill order these from windsor online 🙂 do you know if theyre shoe sizes are the same as steve madden or do they run small/bigger?